“This early Afterlife TV interview with don Miguel Ruiz, the author of The Four Agreements, is a treasure. Based on my research prior to this interview, I originally thought don Miguel Ruiz had a near-death experience. But I quickly learned during this interview that he had an out-of-body experience (OBE) without going into the spirit world. Yet what don Miguel learned from his OBE significantly altered the way he saw things and ultimately changed his life from neurosurgeon to psychologist to philosopher. What I thought was going to be a story about near-death experience turned into a deeply meaningful interview about life and death. don Miguel Ruiz talks about the accident & out-of-body experience that changed his life. 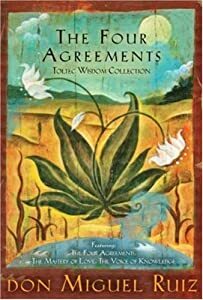 The 3-book set by bestselling author don Miguel Ruiz offers his most widely acclaimed works, and discusses much of the material he talked about in this interview: 1) The Four Agreements reveals the source of self-limiting beliefs that rob us of joy and create needless suffering. 2) The Mastery of Love illuminates the fear-based beliefs and assumptions that undermine love and lead to suffering and drama in our relationships. 3) The Voice of Knowledge reminds us of a profound and simple truth: The only way to end our emotional suffering and restore our joy in living is to stop believing in lies — mainly about ourselves. Buy it on Amazon by clicking here. This 3-book set is a collection of don Miguel Ruiz’s 3 best selling books. The 5 Levels Of Attachment: Written by don Miguel’s son, don Miguel Ruiz, Jr, this is the book don Miguel discussed at the end of the interview. This is a book that picks up where The Four Agreements left off. Building on the principles found in his father’s bestselling book, Ruiz, Jr. explores the ways in which we attach ourselves inappropriately to beliefs and the world. Ruiz explores the five levels of attachment that cause suffering in our lives. Accessible and practical, Ruiz’s exploration invites us to look at our own lives and see how an unhealthy level of attachment can keep us trapped in a psychological and spiritual fog. He then invites us to reclaim our true freedom by cultivating awareness, detaching, and discovering our true selves. You can purchase this book at www.Amazon.com. DON MIGUEL RUIZ’S BIOGRAPHY: don Miguel Ruiz , MD is the international bestselling author of The Four Agreements (a The New York Times bestseller for over 7 years, which topped Amazon’s #1 list after his appearance on Oprah’s Super Soul Sunday), The Mastery of Love, The Voice of Knowledge, and The Fifth Agreement (co-written with his son don Jose). His simple yet profound teachings, based in truth, shared through his books, lectures, and journeys to sacred sites has helped millions of people worldwide transform their lives. Visit don Miguel Ruiz’s website at MiguelRuiz.com. Hi, Bob; looks like I’m going to have to read his and his son’s books! Kudos to you for laboring through this interview; Mr. Ruiz was a little hard to understand but very fascinating stuff! At one point I’m pretty sure he was talking about what current theoretical physicists refer to as the holographic principal in regards to the true nature and composition of this universe.. Outstanding and many thanks to you as always! I appreciate your comments. Nice to hear from you again. Happy weekend! Bob, I sent you an email recently, asking if you were going to eventually do any “new” interviews. I received this one in my inbox and was so pleased! Don Miguel Ruiz is a wonderful and beautiful soul, he explained things so clearly and so simply. It gave me a new understanding of my-SELF. Thank you for posting it, I am deeply grateful, and please keep up your important and great work. I wish you well!